This is due to the fact that our current certificate has expired and is currently being renewed. It will be updated in a few days and the message will not appear anymore. 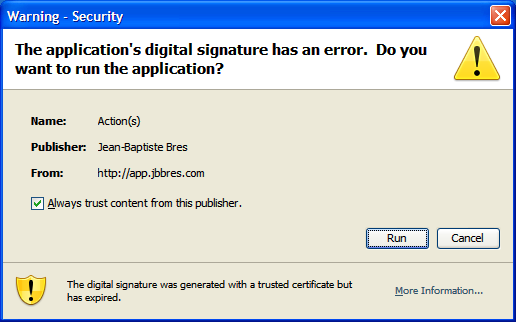 In the meantime, we suggest useds to select the "Allow trust content from this publisher" option or the "Allow all applications from app.jbbres.com with this signature" option and click on the "Run" or "Allow" button.